I will admit this: I am horrible at pulling the trigger on anything that is permanent, i.e. decor for our apartment. I get overwhelmed with serious anxiety and freak out. Perhaps I need therapy. However, I finally replaced that rug with this one and got this table. It’s only taken me like six months to figure it out. At first, I thought for sure I wanted color. Color, color, color. Then I realized that I’m afraid of color except for small doses. So, huge change of plans and enter the below color palate. Yea, I know this is a bedroom but just pretend that the bed is a couch. 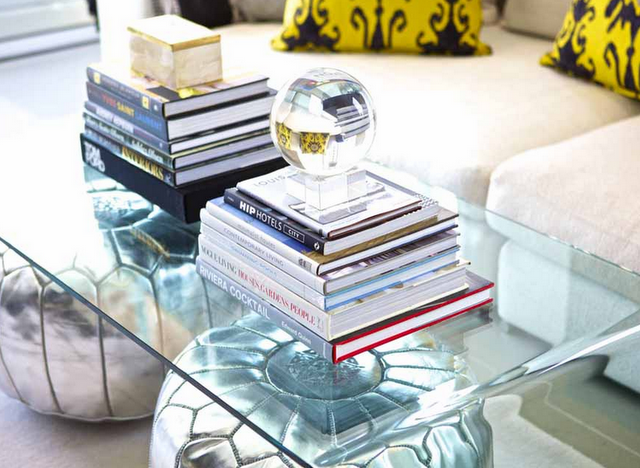 I bought the coffee table from CB2 and I’m seriously lusting after two gold poufs for under the table a la the photo above. I mean, how awesome is this? The ceilings are ridiculously high in my apartment and I’ve been wracking my brain for something fun to do. We’re both kind of obsessed with maps but I can’t find one like this all blue one anywhere. So if you know, please tell me. The map idea is growing on me. Plus AJ will like it. And love the poufs. Need one. we’ve been searching for huge maps for our loft for a while and seriously can’t find anything we love that’s that size under $1000, which i refuse to spend on paper. if you find somewhere, let me know. please. PS – I am starting to pick out new stuff for our move but i’m having anxiety. like really bad. Hi there! Found my way here from Jess over @ Here(and)Now. We had one in our house growing up & I thought it was soo cool! Anyway, new follower. I just love your writing style! I love all of this stuff. Esp the table with the gold ball sacks under them. So cute! that’s the coffee table i want. whatever. i’m mad at you. but i win because i have A pouf. just one…but still, a point for me. wuv you. Sounds like you’re going to have a wonderfully decorated place! I’ve been dying for a gold pouf to put in my new apartment for next year. They add something special to a room. Also, I love your blog & am your newest follower!